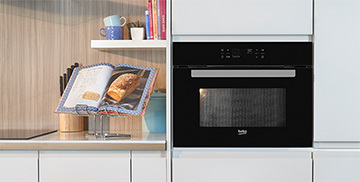 Whether you’re someone who enjoys cooking for the whole family or someone who prefers an oven that’s easy to clean, our built-in oven buying guide will help lead you to the Beko oven that’s perfect for you and your everyday needs. If you’re re-designing your kitchen or thinking about upgrading your built-in oven, the size and capacity of your new oven is one of the first things you should be considering. Read on to find out how each type of oven could suit your everyday needs. Being 60cm in height, you can place them anywhere you like in your kitchen as long as you have the right fuel or power source: from built-in at eye level into your kitchen cabinet column, to built-under your kitchen’s work surface. 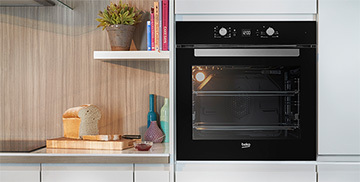 Perfect for families who don’t have enough space for a double oven but still wish to benefit from a large capacity oven, Beko’s range of single ovens has capacities ranging from 65L to an extra-large 82L. When the space in your kitchen doesn’t give you many options, the flexible 45cm height of a compact oven means you can build it into your kitchen’s cabinet columns anywhere you like. Perfect for when you need to cook for only yourself and your partner, Beko’s compact ovens come with a handy capacity of 40L. If you’re looking for a double oven that can be built-in to your kitchen’s cabinet columns, our range of 90cm height models is ideal. 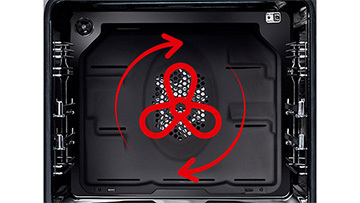 Their main oven capacities range from 65L to 75L with a 38L top oven capacity. If you would prefer your double oven be built-under your kitchen’s work surface, our range of 72cm height models is the most suitable. Their main oven capacities are 48L with a 38L top oven capacity. Have all the information you need? Browse our range of built-in ovens here. If you’re more of a traditional home cook, a conventional oven is ideal. Heat comes from the top and bottom heating elements, operating without a fan to circulate the heat. This provides a traditional style of cooking with hot air rising to the top of the oven. If you do a lot of batch baking or often find yourself cooking different foods at the same temperature, a fan oven is the one for you. 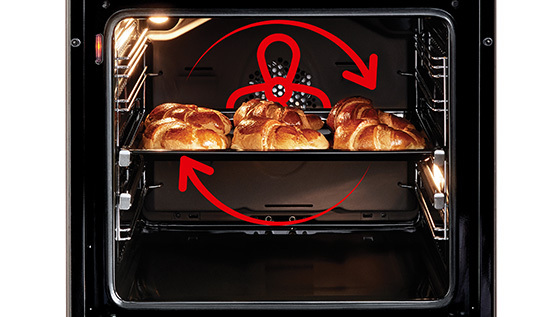 Heat is distributed evenly throughout the oven thanks to a fan (or in some cases multiple fans), being placed close to the heat source. If you're a home cook who loves to experiment with different cooking methods, a multi-function oven is perfect for you. From grilling, to defrosting, not forgetting fan cooking and much more, a multi-function oven allows you to cook virtually any dish. Okay, so you’ve selected the size and type of oven you want in your kitchen, now it’s time to give some thought to the aesthetic and practicality of your oven, namely its colour and display. Depending on the overall look and feel of your kitchen, selecting the right colour for your oven can really help elevate your kitchen’s design. 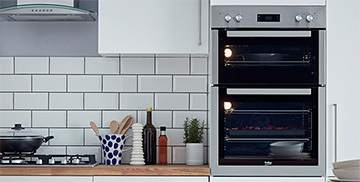 Beko’s range of built-in ovens comes in stainless steel, black and white, including stainless steel finishes. Great for when you’re preparing your food ahead of time, you can set the easy-to-use touch screen LED display to begin cooking at a time that’s convenient to you. 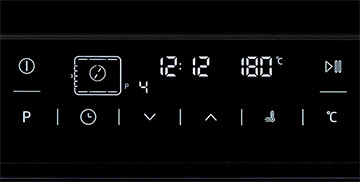 This touch screen display allows you to navigate using symbols. The screen will show you the selected cooking function as well as the perfect tray position for the best cooking results. 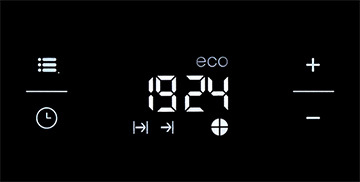 For added control, you can use the dials to set the function you’re after along with the precise temperature for cooking. Helpful and time-saving, this touch screen display comes with 52 pre-programmed recipes. All you need to do is place your tray in the oven and select one of the options from the menu. You don’t need to worry about setting the function and temperature thanks to the pre-programmed recipe selecting the best ones for you. The next factor you should consider when buying a built-in oven is how easy it is to clean. Cooking is a fun and enjoyable experience, but we understand how frustrating it is to spend hours scrubbing your oven clean afterwards. We’ve developed a host of self-cleaning and easy-clean solutions to help you save time in the kitchen. The oven heats up to a super-hot 480°C turning grease to ash, and then all you have to do is use a damp cloth to wipe clean. Steam your oven clean and simply wipe away the dirt. Beko’s range of built-in ovens offers a complete easy-clean solution to help you save time in your day to day life. When space is at a premium but you still want to be able to cook two dishes at the same time, our Split&Cook® technology is perfect for you. It splits the oven in two, allowing you to cook two different dishes at the same time, at two different temperatures, without the blurring of any scents or flavours. 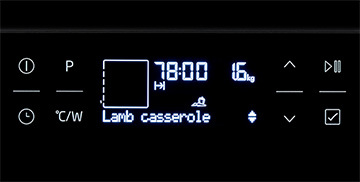 For keen home cooks who love it when their food gets cooked evenly and efficiently, multi-dimensional cooking is ideal. 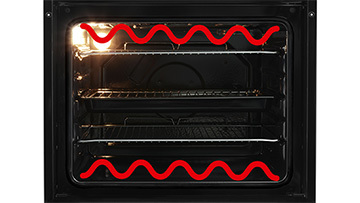 Heat is distributed around the inside of the oven efficiently thanks to a heating element at the top and bottom of the cavity as well as at the back, just in front of the fan. Now that you have all the information you need to purchase the best oven for you, why not browse our range of built-in ovens? Or if you've already decided on the oven you would like, have you considered which kind of hob would best suit your needs? Find out more about our built-in hobs here.